Me, back in the spring of 2008. Man, that XT6 seemed huge at the time. It looks tiny now. Way back in September 2007, even before I had obtained my first telescope, I started keeping a log of my astronomical observations. A bit over seven years later, that log is an Excel spreadsheet that runs to 2564 lines, documenting 595.5 hours of telescopic and binocular observations spread out over 429 observing sessions. As far as I know, I have not missed a single session. Another thing the numbers at this level do not reveal is just how clumpy my observations are. My biggest sustained run of regular observing was July 2009 to November 2010, when I observed 161 times in 17 months. That was followed immediately by a long dry spell, December 2010 to January 2012, when I only observed 19 times in 14 months, and in half of those months I made no observations at all. From May to September 2013, I only went out twice. This year I did not observe at all between January and June. My islands of productive observing are separated by increasingly large gulfs of not-observing. What gets me out often? Observing programs. I did almost all of the observations for the Binocular Messier and Deep Sky Binocular clubs from my driveway, in short sessions. Ditto for the Double Star and Urban clubs. Although I made up logbooks for the Bino Double Star Club and for O’Meara’s Hidden Treasures and Secret Deep, I haven’t started those observations yet. This has implications for my decisions about gear. It doesn’t make sense to keep a large stable of telescopes when I might only get out 20 times in a given year. And if I’m going to a distant site for an all-nighter, I don’t want to take a whole bunch of scopes, I want to take one, or perhaps two at most. The XT10 on one its many, many trips to the Salton Sea. Given that my tally of total objects observed probably stands at around 500 (110 Messiers, 170 other NGCs, ~75 southern-sky objects, 100+ double and multiple stars, 20 or so planets, moons, and comets, sundry IC, Collinder, and Stock objects, asterisms, etc. ), it seems kinda silly to dream about a scope that would show me more than the ~20,000 objects left to see in the XT10, especially when said scope will (a) cost a lot more, and (b) be more of a pain in the rear to set up (since the XT10 is no hassle at all). For a while I thought my compact, do-everything scope might be the Apex 127. But that was before I got into widefield observing and drank the refractor Kool-Aid. Now I think only a 4″ or 5″ apo will do, but that will set me back as much as the 14″ Dob. In other words, not something I’ll be purchasing anytime soon. Ditto for the image-stabilized binoculars. They’re nice, but they’re not urgent. And, in truth, none of this is urgent. My current scope lineup lets me do about anything I want to, and I’ve always been fascinated by pushing humble equipment to its limits. Although I did get one new scope recently–more on that in the next post. 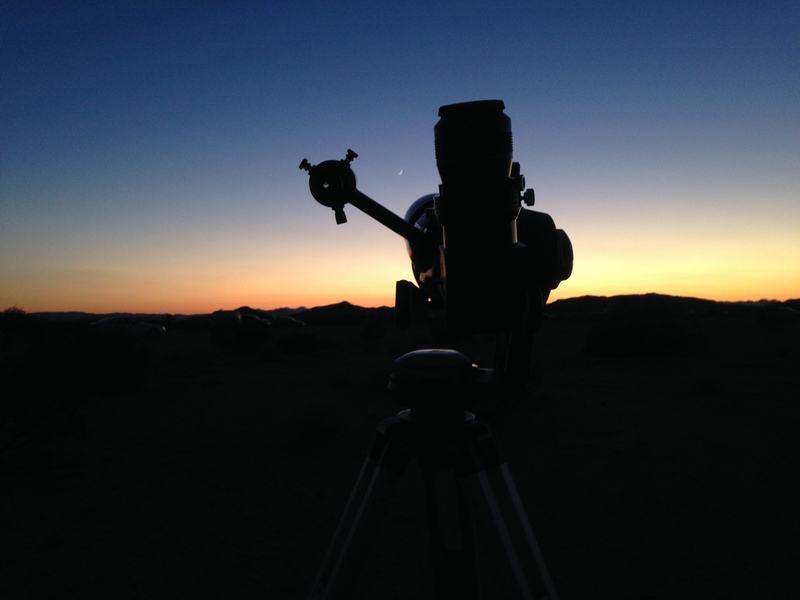 The new scope and the moon at the All-Arizona Star Party last weekend. You are currently browsing the 10 Minute Astronomy blog archives for the day Tuesday, October 28th, 2014.